Anita Dongre, the designer known for beautiful heavy lehengas for brides earned applause for her show stoppers as well as her designs at the Lakme Fashion week winter festive 2015. 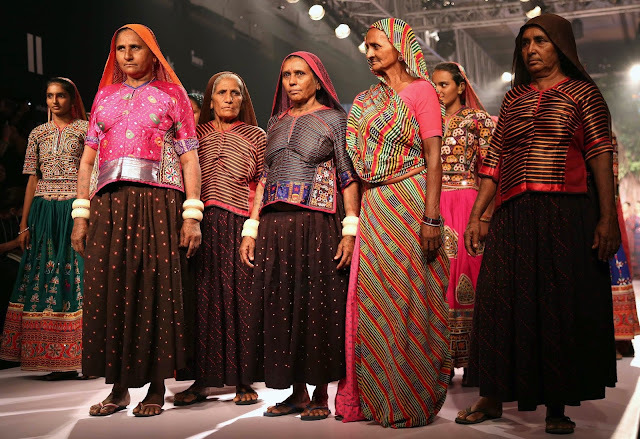 She made 26 craftswomen from Gujarat as her showstoppers. These workers, simple and plain took up the space usually occupied by Bollywood stars and supermodels. Her line highlighted crafts from Gujarat, Karnataka, Rajasthan, Hyderabad and Banaras. Her collection also consisted of crop tops, solid tunics, shirt dresses and gowns. It moved from western to fusion with each piece emphasizing the crafts of Indian culture. With designers like Dongre, giving importance to the lost traditional craft is on its way to recognition and revival. The fabrics were beautiful Bhagalpuri silk with lavish crafts on them. The designer wants to revive the crafts of the different states and bring back the old world charm. 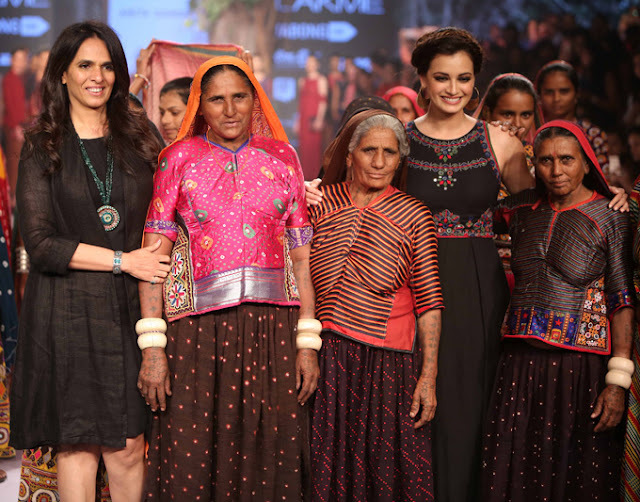 Actress Dia Mirza started the show by introducing the collection named ‘Grassroot’. The show went on from western to Indian wear which showed the Indian women modernized yet rooted to her culture and traditions. The master stroke was when 26 craftswomen walked on the ramp as her showstoppers and the audience couldn’t stop applauding. Anita Dongre’s collection showed that she is a woman with vision and a lover of Indian crafts. She brought them alive on stage and made a mark at the Lakme Fashion Week. She did it different and she did it right! easter message cards easter 2017 wishes easter cards for family Because this is the event for the Christians and it is celebrated around the world. It is very famous and popular event in the world. Father's Day was built up in Spokane, Washington at the YMCA in 1910 by Sonora Smart Dodd, who was considered in Arkansas. Its first celebration was in the Spokane YMCA on June 19, 1910. fathersdaywishesfordad Her father, the Civil War veteran William Jackson Smart, was a lone parent who raised his six children there.